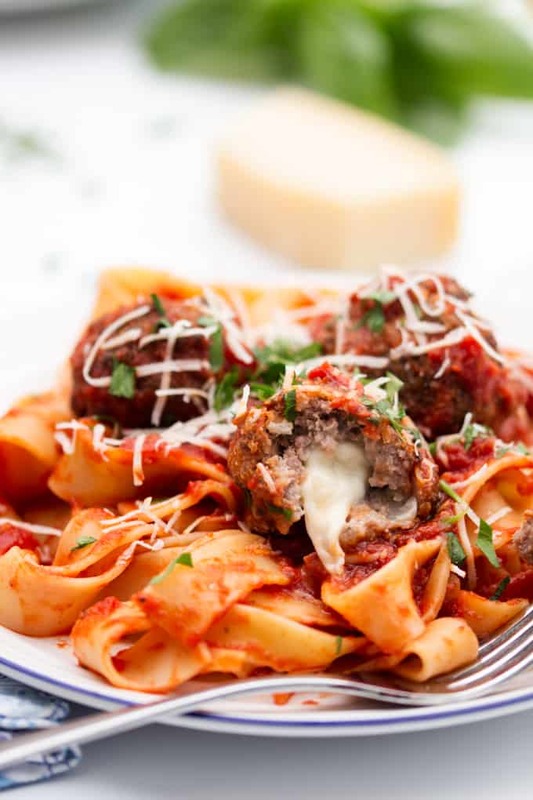 My Mozzarella Stuffed Meatballs with Pappardelle are tender meatballs stuffed with oozy mozzarella, served in a rich tomato sauce with pappardelle. Loved by kids and adults alike! Any day with meatballs is a happy day. 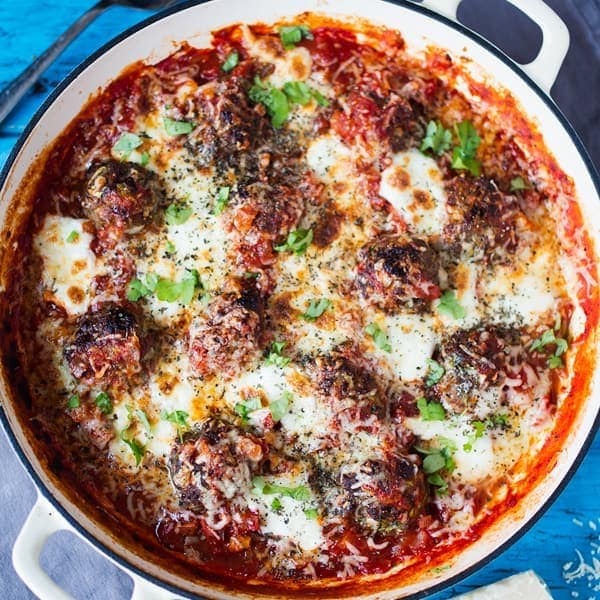 Lovingly rolled, flavour-packed meatballs, baked in the oven until browned and sizzling and served with a rich tomato sauce, piled on top of mountains of tender pappardelle. Everyone around the table chattering and slurping away, oblivious to the tomato splatters on t-shirts and around mouths. Every plate is cleared – guaranteed – with no ‘just one more mouthful and then you’re done‘ cajoling. 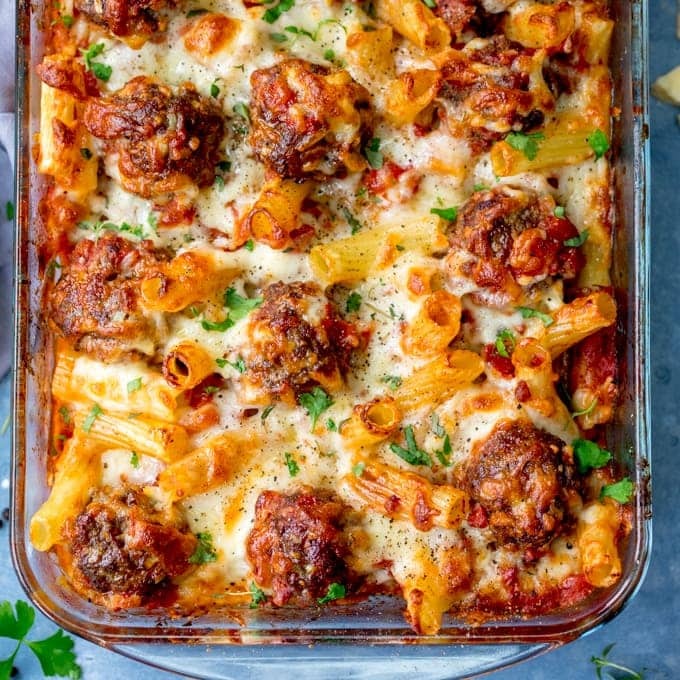 This version is is based on my original recipe, with the addition of some creamy, stretchy mozzarella inside each meatball, and my kids absolutely love them. 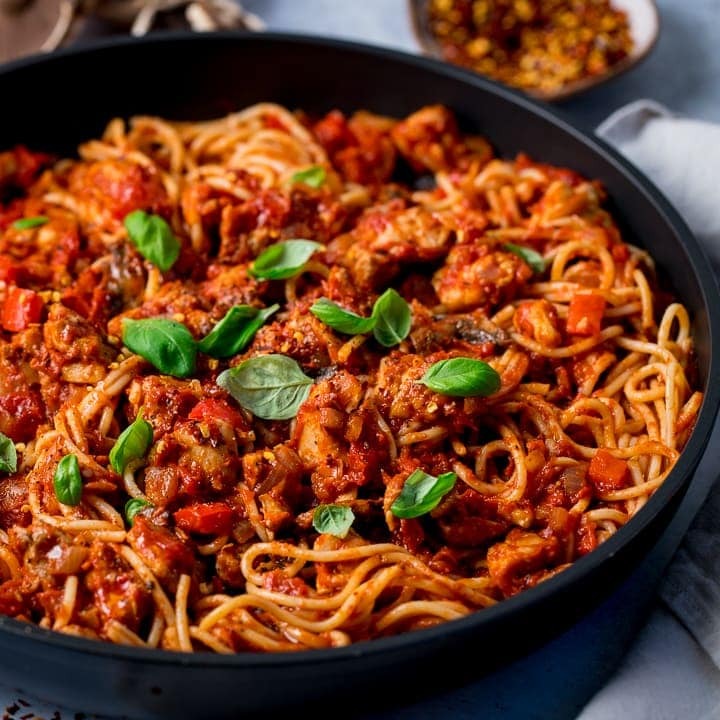 My youngest – Lewis – goes especially crazy for them, which is strange really, since he’s not overly enamoured with similar dishes like spag bol. I wonder if I could get him to eat other other stuff he’s not keen on in meatball form…. This is a great recipe to get the kids involved in. Mushing up the meatball mix is the kind of messy work that kids are made for. You might end up with some meatballs the size of tennis balls, and some the size of marbles, but that’s the charm of letting the kids help out. There’s actually a glass of wine in the sauce, so my suggestion would be to pour yourself a glass, kick off those shoes, and let the kids take control of the meatball making. I mean, how bad could it be? 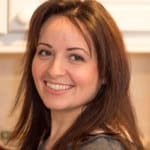 I now have visions of Gracey trying to make butterfly shaped meatballs, whilst encouraging her usual partner in crime (the cat) to jump up and eat some straight from the bowl. Lewis in the meantime would probably be catapulting meatballs pellets at the cat, whilst standing there with his hair covered in raw ground mince. Bleurgh. I think I might just make them myself. 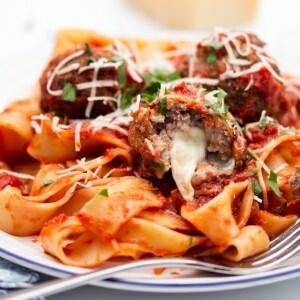 Tender meatballs stuffed with oozy mozzarella, served in a rich tomato sauce with pappardelle. Loved by kids and adults alike! Mix all of the meatball ingredients except the mozzarella in a bowl with your hands. Squash it all together but don’t overmix as this will make the meatballs tough. Take a golf-ball chunk of the mix in your hands and flatten it into a pattie. The place a chunk of mozzarella in the middle and wrap the meat around. Roll into a ball and place on a baking tray, then repeat with the rest of the mix. Put in the oven for about 20 mins. Keep an eye on them toward the end of the cooking time and turn the oven down a little if they start going too dark. Put the water on to heat for the pasta. Whilst the meatballs are cooking, make the sauce. Fry the onions in the olive oil on a low heat for about 5 mins. Add the garlic, and cook for another couple of mins. Add the red wine and let it bubble for a couple of minutes. Add the tomatoes, tomato puree, sugar, oregano and salt and pepper to the sauce and let it bubble until the meatballs and pasta are ready. If using fresh tomatoes, give them a bit of a squish a couple of times during cooking. Also, if you have the rind leftover from the parmesan you can bung it in there too – to add a bit more flavour (just remember to take it out before serving). Drain the pappardelle and put on plates, then add the meatballs to the sauce and give them a quick mix. 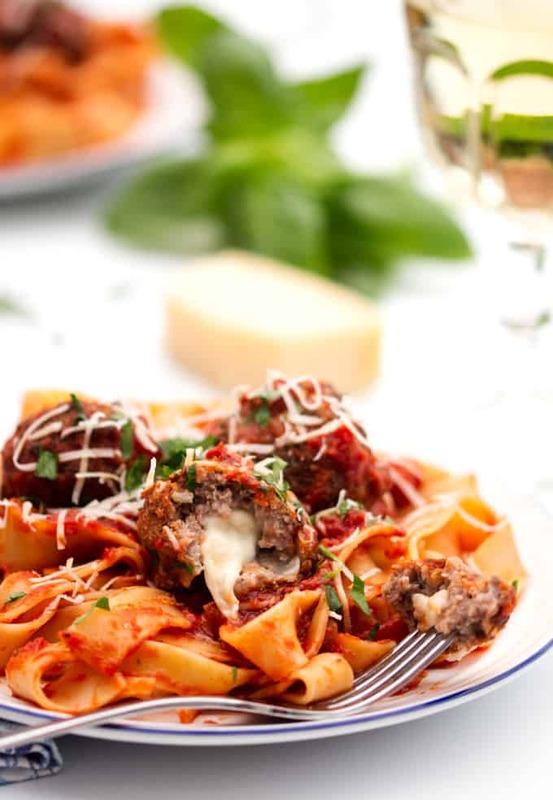 Place the meatballs onto the pasta (I usually serve 4 meatballs per adult and 2 for children) and garnish with some grated parmesan and parsley or basil. Nutritional Information is per serving, without serving of pasta or parmesan. I’ve been meaning to make Pappardelle from scratch for a while now. 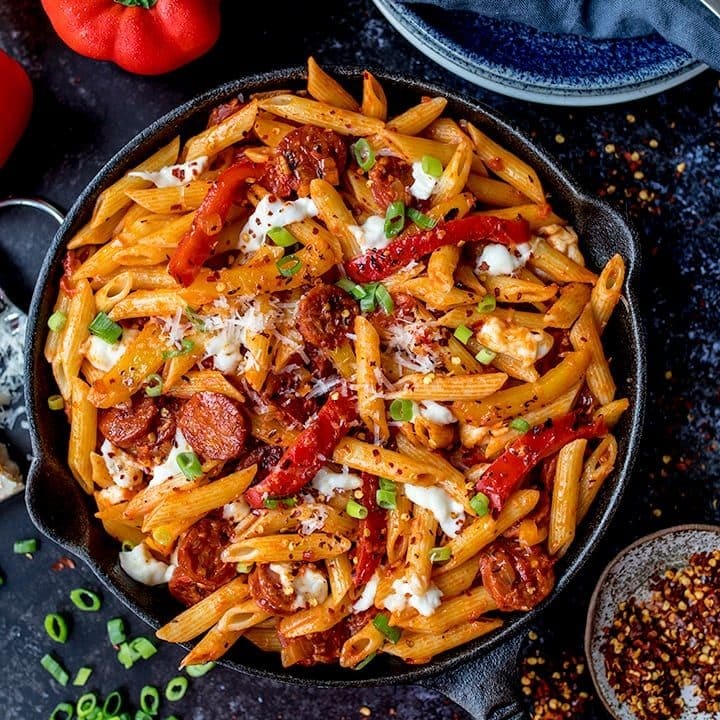 It’s supposed to be one of the easiest pastas to make without a pasta maker. When I do I’m definitely going to make this recipe. Fresh pasta is so amazing and I love the sound of those meatballs. Match made in heaven. I love fresh pasta too, but definitely don’t get the chance to make it often enough. Hope you enjoy the meatballs Patty! Such beautiful photos displaying your mozzarella stuffed meatballs – it makes me want to reach out and grab the screen :). P.S. Your food photography is to die for!! Oh my, oh my, OH MY! *drool* Pinned…!